Ball moss (Tillandsia recurvata) is a small epiphyte commonly found clinging to limbs of liveoaks and other trees in southwest Texas. Ball moss is not a moss, but a true plant withflowers and seeds. It is a member of the bromeliad family, which also contains Spanish moss and pineapple. Epiphytes are plants that attach themselves to limbs, tree trunks, power lines, fences, and many other structures with pseudo-roots. These are not true roots. They do not absorb water and minerals; they merely attach the plant to an aerial structure. 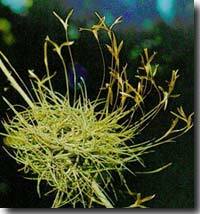 Since epiphytes do not take nutrients and water from these aerial structures, they are not parasites; therefore, ball moss is not a parasite. If ball moss is not a parasite, then why did those branches covered with it die? If you take careful notice, you will observe the majority of these dead limbs are in the interior of the tree’s canopy. Ball moss prefers an environment with low sunlight intensity and high humidity. The interior canopy of trees (especially live oaks) provides an ideal environment for ball moss. These interior limbs die from a lack of sunlight; then the ball moss plants colonize these branches. Should I control ball moss? If the tree is heavily covered with ball moss (to the extent that the plants are covering the exterior of the canopy) or if you just cannot stand having something growing on your trees, control is recommended. If it is a light infestation and does not bother you, control is not necessary. How do I control ball moss? Ball moss can be controlled using three methods: picking, pruning or spraying. Each method alone may not provide adequate control. Using a combination of all three methods results in the most thorough treatment.Picking involves physically pulling each plant off the tree. This method can be very effective, but is extremely tedious and labor intensive. It can also be quite dangerous without the use of a cherry picker. Please use caution and practice proper safety techniques if employing this method. Pruning consists of cutting and removing the dead, interior limbs from the tree and/or lightly thinning the canopy. The majority of the ball moss is growing on the dead, interior limbs; therefore, by removing these limbs, you physically remove the majority of the ball moss. As mentioned above, ball moss prefers areas with low sunlight intensity. Light thinning of the canopy (if necessary) allows more sunlight to reach the interior of the tree, discouraging future infestation. When pruning oaks, make certain to paint all pruning cuts immediately to reduce the risk of oak wilt. Spraying involves applying a chemical to the tree in a foliar spray. Kocide 101 provides adequate control. Do not exceed the recommended rates for this chemical. Higher concentrations of this chemical can actually damage the tree. The ball moss will shrivel up and die in 5 to 7 days, but will remain in the tree until the wind or rain knocks it out. 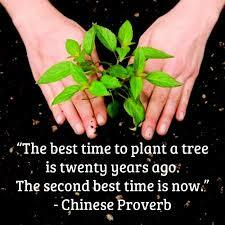 For this reason, it is recommended to prune out the deadwood first. In doing so, you remove the majority of the ball moss from the tree and practice proper tree maintenance at the same time. Neither picking, pruning nor spraying will remove all of the ball moss from the tree, but these treatments can benefit the tree and certainly make you feel better.